Watching ice hockey is a very unique experience; it is a contact team sport on ice with two teams slugging it out on who could score the most points. Fans will be cheering and shouting while the players focus on getting some hard-earned points. It is a very exhilarating thing to watch. Here are two reasons, other than the great players and the very fun fans, why watching a match will make you love Ice Hockey. Entering an ice arena is definitely something you should do at least once. You will realize just how complex it is actually to make the ice thin yet hard enough for people to skate on it. Also, the sounds of metal gliding and scratching the ice is unexpectedly such a nice sound to hear. An Ice Hockey game will have two goals behind a crease (a crease is an area where players, other than the goalie, of course, are forbidden to touch with their body or tools) with 5 players and a goalie on each team, bringing a total of 12 players for a match. The referee, of course, will be there watching and making sure the rules are followed. You can be sure that the seats you are getting will give you a great view of all the action. 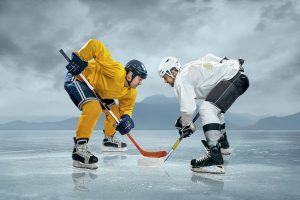 An Ice Hockey game is extremely fast-paced; with the excitement and fun, you will think that the matches are far too short! A professional game will have three periods of twenty minutes each. Once the puck (that is the rubber disk the players are fighting over) is in motion the game already starts and boy are you in for a treat! You will be on the edge of your seat once you see the almost dizzying speed of the players. If you have not gone to an ice hockey match, then you should go to one as soon as you can. Chances are, you will fall in love with it!